What Does A Conditioner Do To Your Hair? 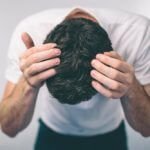 Sure you might be able to pick up the very best hair pomade or even a top notch hair clay to achieve your go to look – but one of the backbones to making your hair look great will be a conditioner. 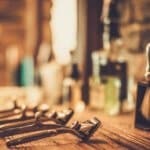 Just like the best beard oils and beard balms, conditioners serve more of a purpose than just making your hair look aesthetically pleasing. 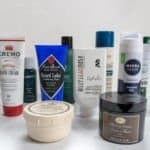 Before we deep dive into the reviews of the best conditioners for men listed further below, we will just touch very briefly on this product and how it works its way into the perfect grooming routine. Along the shaft of your hair follicles you have these little fish scale looking areas called cuticles. This outer layer is comprised of several overlapping layers that will gradually overturn with time. The core purpose of this cuticle layer is to provide protection from general pollutants that you will encounter throughout the day. When you apply an effective conditioner to your hair, it will work to smooth out these cuticles and provide the necessary nutrients in order to give your hair a much more smoother and shimmering appearance. 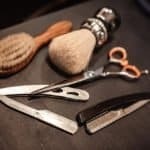 Beyond the looks, strengthened cuticles will help to ensure that your hair follicle remains intact and healthy when you apply your favorite hair product to it regularly. When exploring all the hair conditioners on the market, you will often find that they come in different varieties. Deep conditioner: This conditioner is for intensive treatments. As the name implies, deep conditioners work to get into the root of your hair follicle and will provide a much richer result. To achieve this effectiveness, deep conditioners will typically have to rest in your hair between 10 to 30 minutes. This means that when you apply it in your shower, you must wear a shower cap in order to let the conditioner do its job. As far as regularly, deep conditioners only need to be applied to your hair about 2 to 3 times a week. Any more applications and it may leave even the thickest hair looking greasy (not to mention the waste in money). Leave-in conditioner: As the name applies, this product is applied after you get out of the shower. The primary focus of this product is to of course condition your hair, but also to help detangle as well. Leave-in conditioners do often contain an oil heavy mixture, therefore when its applied, you will want to use it sparingly as a little can go a long way. Rinse-out conditioner: The most common of all conditioners will be the rinse-out conditioner (all of the best conditioners for men listed below are rinse-out conditioners). 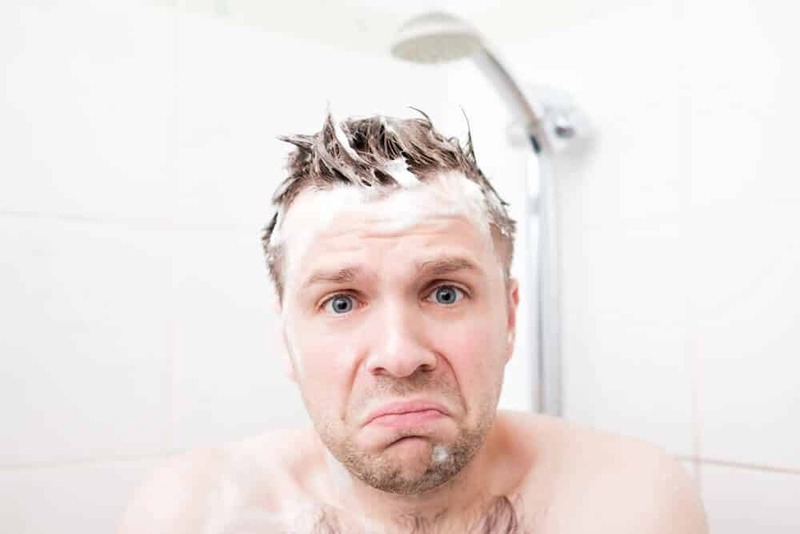 Used while you are in the shower, the rinse-out conditioner should be applied after you have finished washing your hair or simply have gotten it wet and skipped the washing step. This all-purpose conditioner strikes a balance between the two alternatives above as it won’t be nearly as a time-intensive process as the deep conditioner, nor will it be as quick and oily as a leave-in conditioner. While many shampoos and conditioners may be packaged together, doesn’t necessarily mean that you must always use them in tandem. Many men may alternate days on their product use (i.e. shampoo one day, condition the next). While you of course can use a conditioner daily, such a high frequency in use may be slightly overkill. Therefore, try to use a conditioner about 4 days a week. While you might see one product offering the latest and greatest miracle compound that will leave your hair looking and feeling soft, other conditioners may tend to gravitate towards a more natural composition – however there are some baseline ingredients that you should be aware of. 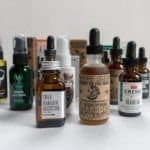 Argan, Jojoba, or other carrier oils: These carrier oils are used in a plethora of products including beard oil, shaving cream, pre shave oil, and more. The reason for their prevalence is that it closely mimics the sebum oil excreted by the sebaceous glands that are along the root of your hair follicle. This oil will help to moisturize both the skin and hair. When looking at carrier oils, jojoba and argan will be the most mild of all oils and give off nearly a muted scent. If closely paying attention, you will notice an extremely mild nutty scent to them. However, with most conditioners containing fragrances, this natural scent will likely be masked. Cetearyl alcohol: While alcohol typically will dry your skin to a crisp, cetearyl alcohol is a fatty alcohol (yes that’s a thing J) that will act as a natural emollient (i.e. softener) for your hair and skin. When contained in the best conditioners, it will give your hair shaft a much softer look. Based on the Environmental Working Group’s database, cetearyl alcohol is rated a 1 out of 10 (i.e. it has a very low hazard level). Vitamin B5 (aka Panthenol): Found in virtually all conditioners, Vitamin B5 will help to repair the damage to your hair follicle. It’s uncanny ability to penetrate the hair shaft and start the repair process is why so many manufacturers depend on this critical ingredient. 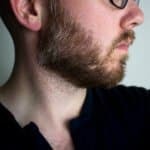 Men who are looking to add volume to their thinning hair will likely notice a difference if they incorporate a conditioner that is infused with this critical ingredient (especially if they weren’t using a conditioner previously). 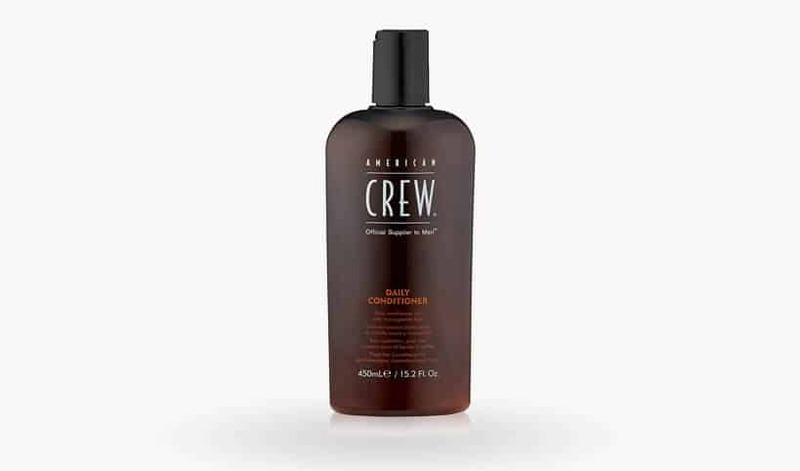 Infused with peppermint oil, thyme extract, rosemary leaf extract, and saponaria bark extract, this conditioner by American Crew (also a maker of top rated hair gels) will leave your hair smelling incredibly fresh post-shower. However, you usually don’t pick a conditioner based on scent right? Well the performance of this conditioner by American Crew is top-notch. Manufactured in the USA, this product uses a mixture of great ingredients included cetyl alcohol in order to give your hair that smooth and silky feeling without being too greasy. 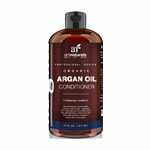 As with most conditioners, this product from American Crew also contains Vitamin B5 (panthenol) which will penetrate your hair follicle to give it the ultimate nourishment it needs. Their sub $15 price tag makes this an affordable product that will be well worth the investment that can perform on level with other top products in this category. Be sure to pair up this conditioner with other great American Crew products like their pomade or hair clay. One of the top selling hair conditioners is going to be from Art Naturals. Focusing on an all-natural compound of organic ingredients, Art Naturals is for those looking to get a hair product that is both effective and natural. 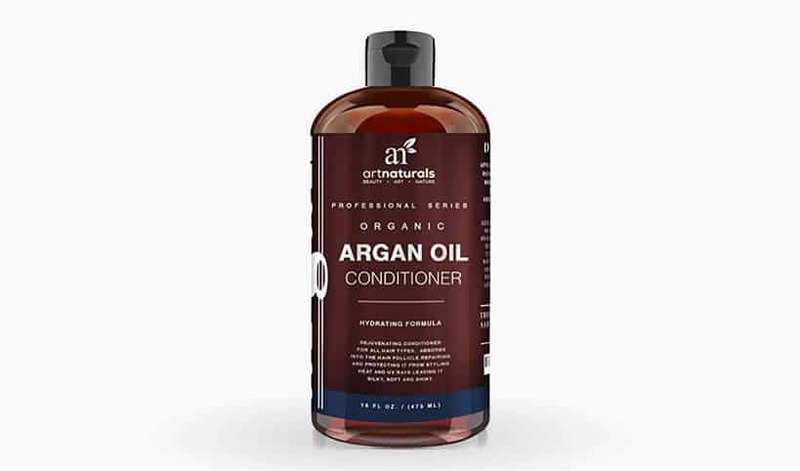 While their beard oil is highly sought after, the Art Naturals conditioner is specially formulated to help with repairing the cuticles along the hair shaft that should deliver an incredibly soft texture that shouldn’t leave your hair looking overtly greasy or oily. This product also goes the extra mile to include ingredients like glycerin, which is a natural humectant, that will help to retain the moisture on both your hair follicle and scalp. Secondly, this product also contains 3 separate vitamins for additional hair and skin health – including vitamins E, B, and C.
Being that this is a unisex conditioner, expect to have an extremely light floral scent when its washed out. If you plan on using a pomade or hair clay with this conditioner – the scent will likely fade away when the product is applied. This is a rinse-out conditioner and should be able to work its way seamlessly into your shower routine. Lastly, this product is made in Morocco however was bottled in USA. If there was one men’s grooming product that is quality while also relying on all natural ingredients – the answer would be Jack Black. Maker of some of the finest shave creams, beard lubes, and so much more – this Hair & Scalp Conditioner in their Pure Science line is nothing short of perfection. With a careful combination of just the core ingredients to get the job done – this top-shelf conditioner will leave your hair looking healthy while also being a pretty damn good environmental and animal conscious product. Relying on Vitamin B5 to keep your cuticles looking and feeling healthy, this conditioner also features jojoba oil, with its extremely mild properties, should nourish your hair and scalp with incredible effectiveness. 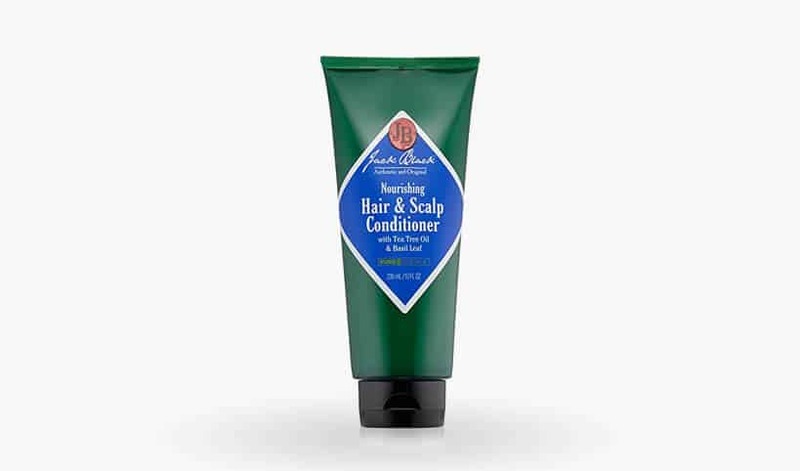 Beyond the jojoba oil, this conditioner by Jack Black also contains tea tree leaf oil. Tea tree oil, if you aren’t already aware, is a natural oil that also doubles as a natural anti-inflammatory. This means that it will help to ward off any sort of dandruff and general dryness for your scalp. Lastly, this product also relies on peppermint oil to keep the scalp invigorated and feeling fresh. When looking past the carrier and essential oils, it also contains natural ingredients like kelp that will help to further thicken the shaft of your hair follicle. This is key (coupled with Vitamin B5) to adding volume to your hair, especially if your follicles tend to be slightly thinner. This isn’t hippy stuff, Jack Black’s products are top notch and worth the investment. Oh, and it’s made in the USA – ‘MURICA! Making products without compromise is Woody’s mantra. This conditioner is no different when compared to the rest of the products within their lineup. 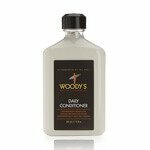 Woody’s conditioner is made in the USA (Los Angeles) and is formulated to keep your hair intact through its mixture of both natural and synthetic ingredients. First and foremost, this product relies on a tea tree oil (much like Jack Black reviewed earlier) that will help to reduce the dryness and itchiness of your scalp. In addition, you will find other great ingredients included in this product, with the most notable being Vitamin B5, wheat germ oil, peppermint oil, jojoba oil, along with several others. This is a rinse-out conditioner that will be able to effortlessly work its way into your daily shower regimen. 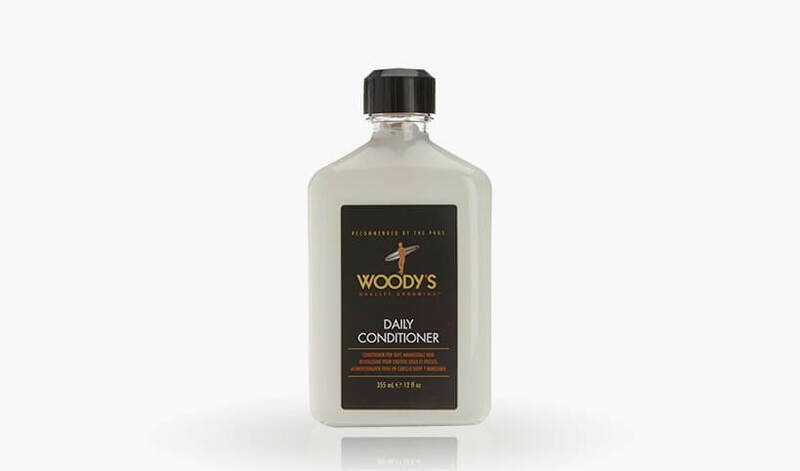 As mentioned on the bottle itself, Woody’s conditioner is geared towards men of all hair types. 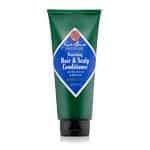 If you are looking for an affordable, yet effective hair conditioner specially formulated for men that isn’t from one of the big name manufacturers, then this conditioner from Woody’s is worth a shot. This conditioner by K + S (krieger + söhne) is specifically formulated for men with dandruff or generally dryer scalps. Relying on peppermint oil to invigorate the scalp and help ward off any sort of dryness, this conditioner also comes packed with a load of other great ingredients to effectively keep your cuticles intact and leave what was once a dry hair follicle now smooth and shiny without appearing greasy. Beyond the peppermint oil – this product contains burdock extract. As claimed by the manufacturer, this ingredient will help to purge all the toxins from your hair and to help stimulate new cellular growth. While the name krieger + söhne may infer a German heritage, this product is formulated in the USA. For the value you get with this bottle – it will make an excellent addition to your grooming routine. Lastly, K + S does offer a no hassle money back guarantee, so if you aren’t happy with the product you can easily return it. Much like the American Crew conditioner that we reviewed above, Redken is an extremely popular hair product brand that can be found in just about any barbershop across the United States. Their incredible distribution breadth makes it a product that you can pick up at your next haircut or simply by ordering with a few clicks of the mouse. This conditioner from Redken is another top-notch product to their lineup that will perform well for normal to dry hair and is loaded with the core essential ingredients. Most notably this product contains cetearyl alcohol to ensure softness, along with proteins to keep your hair feeling incredibly strong. 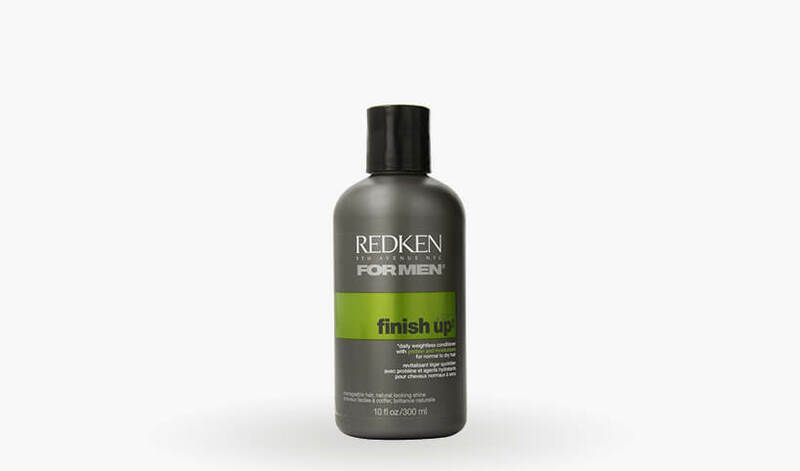 If you are looking for a well-established salon brand that is both affordable and effective – then the Redken Finish Up conditioner that is designed specifically for men’s hair should be a great choice. 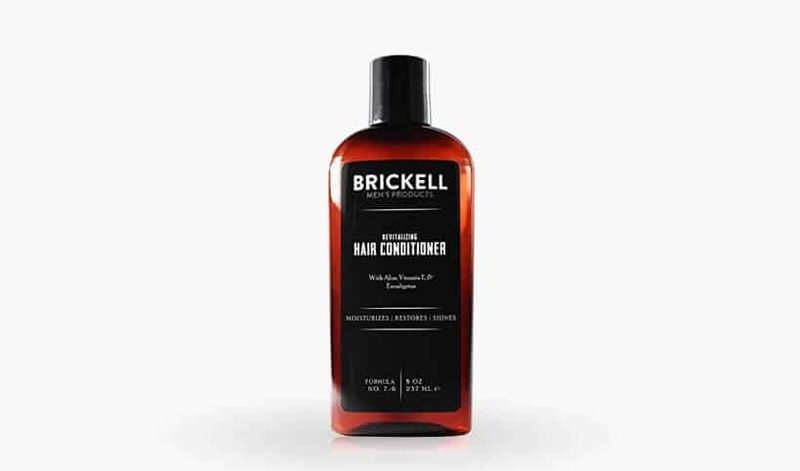 Among the highest peer reviewed conditioners for men (Rugged & Dapper currently holds that distinction), the Brickell Men’s Revitalizing Hair conditioner is going to be one of the best conditioners for men with thinning hair. 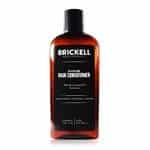 This conditioner by Brickell uses organic aloe vera as a base which adds a ton of moisture to the shaft of the hair follicle – which will generate volume. 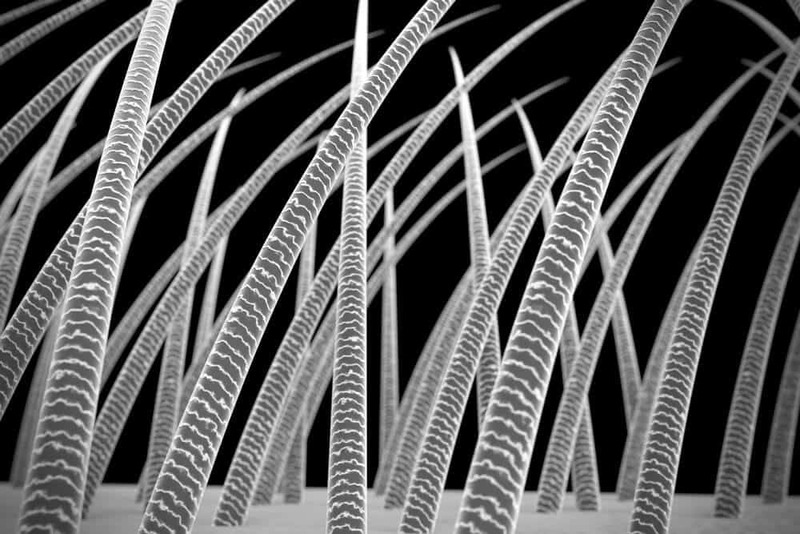 This will make ordinarily thin hairs look extraordinary. What’s nice about aloe vera being included in the conditioner, is that it works near instantaneously. 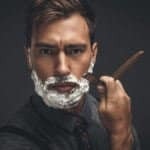 Therefore, you don’t have to wait several weeks for results as is common in some other men’s grooming products. Beyond the aloe vera, this conditioner also contains Vitamin E which will help spur on hair growth. This unique combination of ingredients is why this is one of the best conditioners on the market for men with thinning hair. 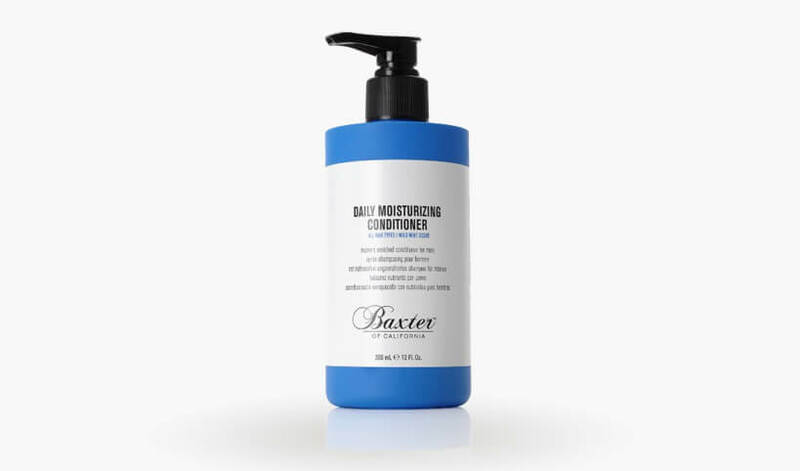 After its volumizing properties, this conditioner also features a few essential oils, namely peppermint, lemongrass, and eucalyptus (to just name a few) that will provide some additional soothing properties. Lastly, if you color your hair, this conditioner shouldn’t spell disaster to your locks as it wont wash away the coloring. 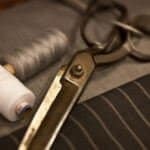 When most men think of Baxter of California, they automatically associate it with a high-class product that, while commanding a higher price tag, delivers quality. This conditioner that is designed specifically for men is no different. Containing all the core aspects that every conditioner should have: cetearyl alcohol, jojoba oil, and panthenol (Vitamin B5), simply put – the basics are covered. But what truly makes this conditioner one of a kind (and one of the best conditioners for men on the market) is that it contains a plethora of other great ingredients to suit nearly all hair types. This includes reliance on aloe vera leaf juice (for volume and sheen) along with peppermint and rosemary leaf oil for a soothing scalp sensation. While the price may be higher – there is no doubt that you get what you pay for with this product from Baxter. Also to note, this conditioner does compliment their highly regarded pomade that was a part of our best pomade article. Lastly, given that the name of this product includes California, it’s not just marketing fluff, this stuff is made in the USA! What’s not to like about Rugged & Dapper? One of the highest peer reviewed scores, this conditioner might be the last one that you ever use. Now normally when looking at an ingredient list, you find a mixture of so much stuff you could never pronounce if your life depended on it. However, when examining this conditioner by Rugged & Dapper, there is so much good stuff contained that it will be one of the best conditioners you can get your hands on. This conditioner contains aloe vera, panthenol, coconut oil, tea tree oil, jojoba oil, and rosehip oil to just name a few. Furthermore, this conditioner is also paraben free, sulfate free, free of artificial fragrance free (which we know some of the dangers when it comes to fragrances), along with being vegan and cruelty free. So, whether you have thin, thick, coarse, or normal hair, this well-balanced formula should suit just about any hair type. Like many of the other conditioners reviewed, this product is manufactured in the USA. If you are still skeptical on trying out this conditioner, its backed with a 100% satisfaction guarantee for 60 days. No risk + great looking hair – what’s to lose?